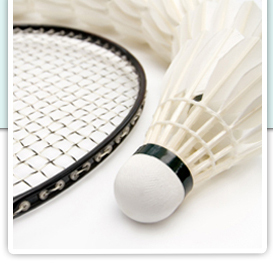 Finding the right badminton club for you can be tricky. Often a catch-22 situation can arise wherein you need to improve in order to join a decent club but can't improve without playing competitive games. It's important to find a badminton club with the right spectrum of abilities that will allow you to move upwards as you get better. It is a subject that is quite neglected in Badminton clubs and in general, but is quite important - especially to some of us who train hard and play hard. I hope that whatever you do in regards to hydrating yourself during sports this may make you feel comfortable in your regime or give you more understanding in what you can improve on. Plyometric training has been around for several years now and is particularly relevant to any sport involving fast, explosive movements such as badminton. Defined by the dictionary as 'a form of exercise that involves rapid and repeated stretching and contracting of the muscles, designed to increase strength', there are numerous exercises which a badminton player can use to improve his or her game. A defender in football might have the task of marking an opposing striker. Some of the things the defender can control include: how fast he or she moves, their height when jumping, deciding whether the best thing to do is to man mark or zone, stay relaxed and composed, keep an eye on the ball and be aware of his or her immediate surroundings. I'm sure that you parents have found out that Badminton is not the cheapest of sports haven't you? Children can play football completely free of charge out on the green with a couple of mates can't they? Having coached the sport for over 20 years I thought I'd share a coaching point of view with you. One of the fastest and most exciting games of badminton is the game of mixed doubles! The strategies for playing, challenges the knowledge of the game and the minds of the players every second of the way. It allows the different strengths of the two players to synchronise as one complete unit, to challenge the skills of the opposition! When learning any sport or discipline, the benefit of an independent eye should not be underestimated. A coach will see your game from a different angle and be able to suggest changes that you may not have even considered.